Best of the Week: Sonos Beam, World Cup in 8K, Watch Wimbledon in 4K and more | What Hi-Fi? A round-up of the week's highlights, including a review of the Sonos Beam soundbar and the FIFA World Cup in (gasp!) 8K. This week, Google's smart speakers and Chromecast dongles had technical difficulties, the BBC has augmented its iPlayer Radio app and you can watch the FIFA World Cup in 8K… if you're in Brazil. 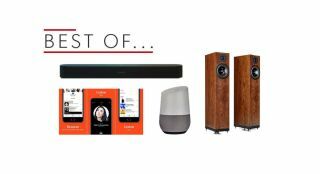 For reviews it was an impressive week, with Sonos's Beam soundbar, Spendor's A7 floorstanders and Audio Pro's Drumfire wireless speaker being the highlights. If you own a Google Home speaker or a Chromecast, you may have been experiencing some technical difficulties. In recent days, Home, Home Mini and Chromecast dongles have been responding to commands with "there was a glitch" or "sorry, something went wrong". It is not clear why this happened, but reports suggest that simply rebooting the device restores functionality. A update to fix the problem has also been rolled out. The BBC's iPlayer Radio app has competition from its own family. It has been joined by the public broadcaster's new BBC Sounds app. With over 80,000 hours of content available on the platform, the app now offers unique recommendations by learning from your listening preferences. BBC Sounds is available on Android and iOS now. We predicted that FIFA would trial 8K for the World Cup in Russia, and it appears you can now watch the action in the format. Satellite operator Intelsat has teamed up with with Latin American broadcast Globo to broadcast matches in 8K, however they are only available in Brazil. To watch in 8K, you will have to visit Rio de Janeiro’s Museu de Amanhã, where it's currently part of an exhibition running up to the World Cup final. Will Apple spend $1bn to launch TV/music/news subscription bundle? "This is an affordable soundbar that most could find space for"
We've already had the Sonos Playbar and Playbase, now the company is continuing it's attempt to break into the living room with the Beam soundbar. It's smaller and cheaper than previous soundbars, but delivers an exceptional sound that's open, spacious and surprisingly capable with bass. Throw in a HDMI ARC connection and voice control integration, and this adds up to an astounding compact soundbar. "Audio Pro’s sonic chops only get better as its speakers get bigger"
We've been mightily impressed with Audio Pro's recent products, and the Drumfire does not disappoint. It's the biggest speaker in Audio Pro's multi-room range, with a performance that offers a clear midrange, tight bass and loud, loud sound. The app is still too fussy for our tastes, but this is a decent wireless speaker. "Continues Spendor’s knack for combining stunning precision, clarity and subtlety with hugely enjoyable dynamics and rhythm"
The A7 continues Spendor's ability to combine precision, clarity and hugely enjoyable dynamics. The build quality is up to a high standard, and the finish is impeccable. The sound is expressive, and one we never tire of listening to. If you're in the market for a new compact floorstanding speaker, the A7s should be at the top of your list.